Close to the street from Stoupa towards Neochori, about 1,5kms from Stoupa, you will find these new stone houses. Each with its own hydro-massage pool including wooden sunbeds, umbrellas and barbeque (charcoal provided). All houses have in front a shady veranda with sea view - in the back a smaller balcony with mountain view. The smaller houses (approx. 60 sqm.) are suitable for 2 to 3 people and have beside the air conditioned sleeping room a spacy living room with open fire place and another sleeping possibility on the convertable couch. The very well equipped kitchen is integrated. The very well kept and comfortable houses have mosquito nets on all windows, satellite TV, dvd, radio/cd, coffee maker, washing machine and of course the bathroom with shower. The bigger house (approx. 80 sqm.) with its two air conditioned sleeping rooms sleeps up to 5 people, the equipment is similar to the smaller houses. The friendly owners live close by. Bed linen and towels will be changed twice a week. 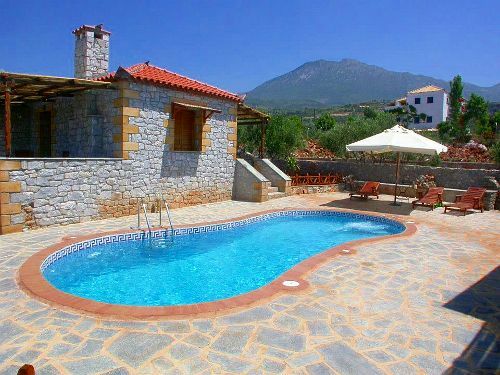 Upon arrival everything for your first breakfast will be there and the owner invites his guests once per full week to his own restaurant in Stoupa for dinner! Do you know this accommodation? Your rating will help others to make the right choice! Remember: This is not an inquiry form and will not generate a reply! Please use our inquiry form instead.